A few years back, this book was talked about highly in every bookish circle. I waited for the hype to die down and gave it a read recently. It is indeed an uplifting and charming book that remains with you for a long time. Guernsey, or better known as the Bailiwick of Guernsey is a British Crown Dependency in the English Channel. This little island was occupied by the German troops during World War II. After substantial research on this island, the author Mary Ann Shaffer has woven a bitter-sweet historical-fiction set right after the end of World War II. In order to ameliorate the pain and bleakness of the German occupation, the inhabitants of Guernsey end up creating a Literary Society - the Guernsey Literary Potato Peel Pie Society. The story behind the Literary Society’s initiation is both sad and uplifting - it was literally an excuse that was concocted by a quick-thinking inhabitant to escape punishment from the German soldiers. What is a Potato Peel Pie? It was a regular dish that was served during the meetings - a pie made from potato peels, because there wasn’t much else to feed on. The title says it all - the hopes, positivity, strength, and communal harmony among a simple group of people who lived through five years of mistreatment and despair. Back in London, Juliet Ashton is a witty newspaper columnist who successfully employed humor to diffuse the sadness and tension during the war. Although the war is over, she is still haunted by it and struggles to find her footing as a writer. But, this tale is full of happy, serendipitous events. 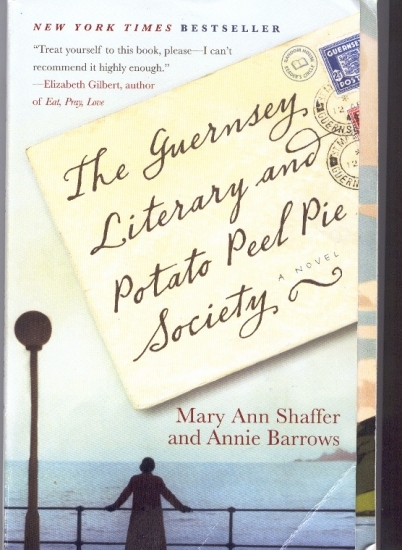 She comes to know of the unique Literary Society in Guernsey and begins communicating with the members. Before long, she is in love with the island and the friendly people, and the writer in her is awakened. The rest of the book focuses on the stories Juliet discovers, and how they shape her book as well as her life. A unique aspect of this book is that it follows an epistolary format - that is, the whole book is a series of letters exchanged between the various characters. The stories, the social scenarios, and characters unfold through the letters. I loved this novel element as it gives a lot of character to the book! But the downside to this narrative style is that it becomes much harder to define and develop the characters. It is a challenge to infuse distinct writing styles that tie with the character’s personality. So, some characters have identical writing styles, making them lose their individual “voices”. The characters are also not complicated or layered - they are either good or bad, which works well in this format. Juliet, the protagonist is downright witty, humorous, and genial. And so are most of the other characters. Therefore, the overall tone of the book is quite Wodehousian. The phrases, the adjectives, the narration, the British tongue-in-cheek sense of humor is all Wodehouse-inspired, which is to say, I was smiling almost all through the book. And this is a delightful quality in a book that sounds so dreary and heavy with tragedies of war. The writing is eloquent and witty. There is also a bit of Pride-and-Prejudice-inspired romance in this tale, which is predictable, but endearing all the same. Annie Barrows (the second author) is a children’s writer, so I could definitely see her influence seeping into the tale. Guernsey is turned into an idyllic sister of Avonlea (the fictional community in a Canadian island that frames the “Anne of Green Gables” series). Guernsey is projected as an Utopian haven, very much like Avonlea. The inhabitants also remind us of the friendly characters in Avonlea, each with a unique quirkiness, loads of goodhearted traits, and innocence. And the end of the book most certainly reminded me of a fun episode in Anne’s life, where everything just comes together to make a happy ending. So, a book that is inspired from Wodehousian humor, children’s classics, and real, tragic, historical events - sounds like an interesting mix, doesn’t it? It is. For all its predictability, the contrived feel-good moments, and the horrific stories of war, the book is still a unique and uplifting read. It is also a pleasant treat for book worms, literature enthusiasts, and bibliophiles who turn to words, stories, and refined expression to take a break from life’s challenges. Mary Ann Shaffer writes - “I hope, too, that my book will illuminate my belief that love of art - be it poetry, storytelling, painting, sculpture, or music - enables people to transcend any barrier man has yet devised.” I cannot agree more. The book is a testament to the strength one can gain through communal harmony and interest in art. It also reiterates my belief that humor (and laughter) is the best healer. The pages are filled with positivity, wit, hope, strength, kindness, and humaneness, in sharp contrast to the dehumanization of man during the war. I loved the style this author chose to tell her story. She made the characters come alive through letters written back and forth between many of the characters. She told of a mostly unknown tale of World War II as it happened in the Island of Guernsey. She wove enough romance, humor, and intrigue into the pages to make it interesting yet still light reading. Thanks for the comment Sverige :). Yes, I loved the epistolary style and the nice balance of humor, romance, and history.